I'm sure people are as tired of reading about my cough as I am of of having one. My cough was as bad as ever this morning. My daughter had her annual checkup today and my wife mentioned her lengthy cough to the doctor. The pediatrician said it's likely to be allergy related, that the pollen is really high this year. She suggested taking Claritin. The only version we had was children's grape chewables, but I went for it. I'm not sure whether it's helping, but I'm a bit better than yesterday (and earlier today). The weather was highly cooperative this morning and I took full advantage by running around the neighborhood. It actually felt cold when I first stepped outside. It was a combination of shade and breeze that masked the heat from the sun and humidity. The run went well, and with middle and high school finished, there was less car and bus traffic to contend with. I was surprised to see that my pace was faster than I expected. These weekday runs are all pretty much the same. I can vary my route a little, but by now, every road looks as familiar as my back yard. I literally have hundreds of identical route maps on Garmin Connect. There's only so many combinations of streets that take me around for at least three miles and then back home again. The great thing about these runs is that they give me thirty or so minutes of relief from coughing. 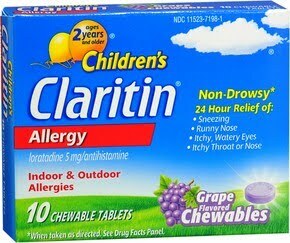 Tomorrow I'll start on adult doses of Claritin. Perhaps that will give me something to write about besides coughing.